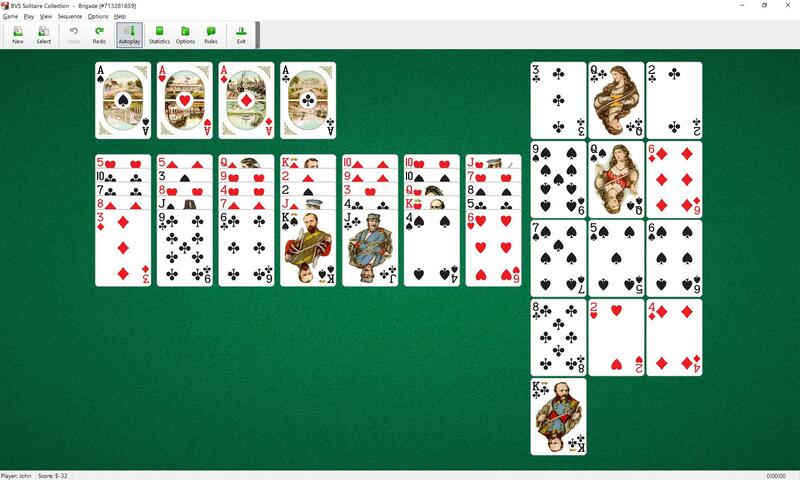 Brigade Solitaire uses 52 cards. Aces are removed from the deck to form the foundations. You have 7 vertical tableau piles with 5 cards in each pile. You also have 13 open cards to the right of the vertical piles - reserve.
. All top cards of tableau piles and all reserve cards are available to play. You can move cards from one tableau pile to another one and from reserve to tableau pile. You can build tableau piles down regardless of suit. Only one card at a time can be moved from pile to pile. Brigade Solitaire is one of the solitaire card games included into the BVS Solitaire Collection.